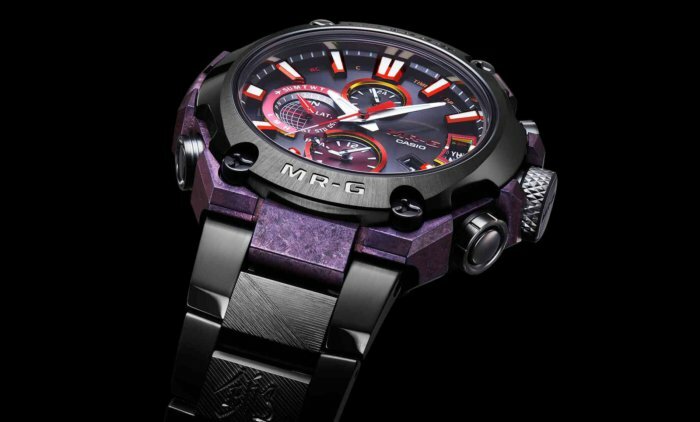 The announcement of a specially crafted limited edition watch from G-Shock’s flagship MR-G line is an annual tradition at Baselworld. Like the MRG-G2000RJ-2A from January, the MRG-G2000GA-1A is inspired by the strength and refinement of Japanese swords along with the highly skilled craftsmanship that goes into producing them. This model is limited to 300 units and is hand-finished by Sadanobu Gassan, a master craftsman in the world-renowned Gassan tradition of Japanese swordsmiths. 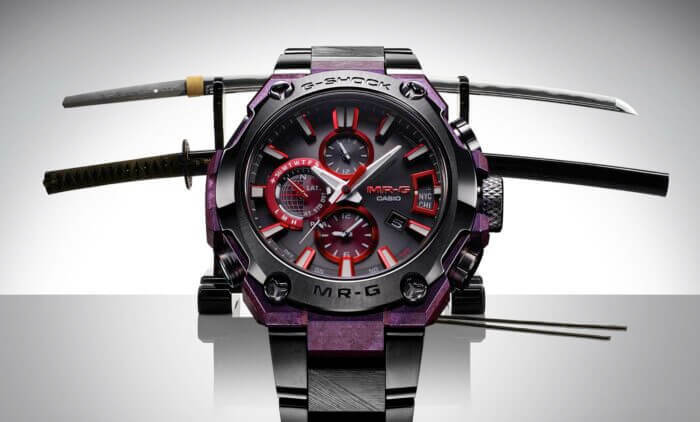 The watch features several design elements inspired by the different parts of a Japanese sword. The tang of the sword is inside the hilt and “yasuri-me” rasp marks are applied to prevent it from slipping out. The pattern on the center band of the MRG-G2000GA is modeled after the file mark pattern used by the 800-year-old Gassan tradition of swordsmiths, and is hand-applied to each link by Sadanobu Gassan. The second link in the center band is also inscribed with the kanji character 鍛, from the Gassan motto tanto hitosuji (“a singular dedication to forging”). The watch case is made of recrystallized titanium that gives it a sparkling appearance that evokes the crystal formation of the temper line on the blade of a sword. An Arc Ion Plating is applied with a deep purple color that is traditionally associated with nobility in Japan. The bezel is made from Cobarion which is twice as hard as stainless steel and has a beveled shape that is inspired by the blade tip of a sword. 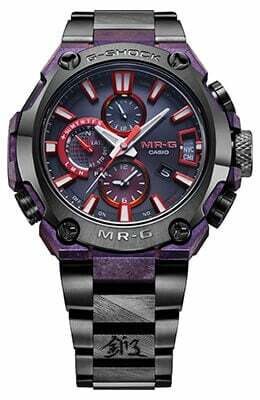 Along with its beautiful appearance inspired by the traditional Japanese swords of the Gasssan family, the MRG-G2000GA-1A is one of the most technologically advanced G-Shock watches featuring Tough Solar power and 3-Way Time Sync with Multi-Band 6, GPS timekeeping, and Bluetooth mobile link. Update: Casio America announced the MRGG2000GA-1A for a July 2019 release with a list price of $7,400 USD.